I lost some pounds when I was living in London (weight that is, not their money, well I lost a lot of that too) and most was due to the amount of walking I was doing (the same happened when I moved to NYC), but the other part was that I was broke and cooking for myself. The London groceries were mainly small stores with one or two choices and not the aisles of selection that I was used to with our supermarkets. For instance, instead of an aisle of cereals, they'd have just four cereal options and that's it (go Weetabix!) and I couldn't find a box of Kraft Mac and Cheese, peanut butter outside of Nutella or Lucky Charms. So, I had my mom ship a $50 care package to me with all of the above. What can I say? Old habits die hard. Besides the Weetabix cereal and some Jammy Dodger shortbread cookies, I did get addicted to Tesco's Bolgenese sauce, which I'd cook with pasta and feed myself and the guys in my flat. I was floored when I heard this week that Tesco, the UK’s largest retailer, has already started invading the U.S. in the form of Fresh & Easy neighborhood markets. I immediately headed to the local Fresh & Easy in Hollywood during my lunch hour for some pre-packaged meals and of course the pasta sauce. Basically, the store is like a more modern looking Trader Joe's, they even have a Two Buck Chuck competitor, the Big Kahuna cab and chardonnay, which also sell for only $1.99. Apparently the store won 7 wine awards at the SF Wine Festival too. I also randomly picked up a chocolate tea, which sounded interesting, a pomegranate lemonade and a cranberry scone. Unfortunately, there was no Weetabix though, but the store had the same color coded aisles that I was used to across the pond and lots of to-go meals. Like Trader Joes and Costco, Fresh & Easy also gave out some free samples-- I drank some yummy pineapple juice and tasted a spicy chicken tortilla sandwich. 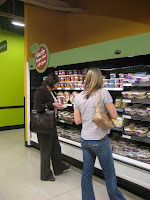 Anyway, it will be interesting to see if more Fresh & Easy's continue to sprout up over here, there are 50 so far and according to their site, 18 stores in the Bay Area are slated to begin opening in 2009. PS: I'll be doing a mini road trip this coming week with Raphael. We are driving from Houston to New Orleans, then back to Houston and on to San Antonio and Austin. I've never been to any of those cities so it will be fun and I have a few friends along the way that I look forward to seeing. I'll try to do some mobile blogging so keep checking back. WHEETABIX! Oh, god, I love Wheetabix. I started eating them when I first went to Australia and got hooked on them there; finding them here can be a struggle, but occasionally I'm lucky. I haven't been here in forever! I don't think we have a store like that around here! Have fun on your RT! I really need to move near a trader joes so I can buy 2 buck chuck. I've never even tried it. I never had the pleasure of visiting a Tesco while in London. The boy & I often shopped at ASDA or at the Sainsbury Express in Clapham Junction station. The boy & I actually want to do the roadtrip you described...so definitely provide updates!! I love love LOVE little grocery stores; they absolutely make me happy. We have a (very) small Brit market and tea-house in my city, and I love picking out something from their shelves. Good luck on the road trip! Isn't it funny how we always crave what we can't have easily. I love Ralphs but mainly because I am so far away lol. Weetabix ewwww easily obtainable for me but I don't want those.